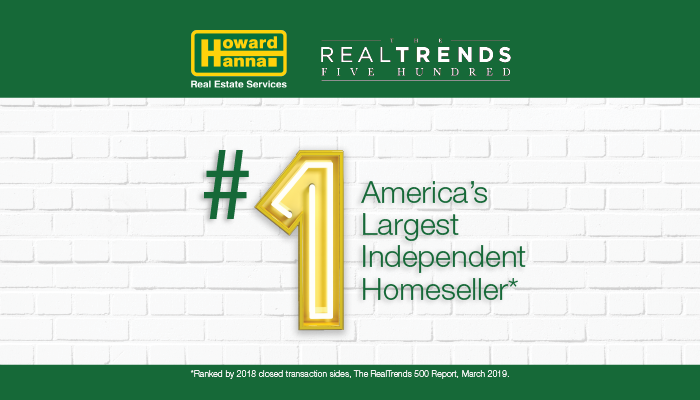 Pittsburgh, PA (March 29, 2019) – Howard Hanna Real Estate Services continues to hold the title of Largest Independent real estate firm in the nation, according to the 2019 REAL Trends 500 report released on March 27, 2019. Privately owned by the Hanna family since 1957, the company retains its ranking as 3rd largest real estate company in the United States based on closed transaction sides of 83,043 in 2018. Howard Hanna has been ranked the 3rd largest broker in the country since 2017, when it moved up two places in the rankings based on 2016 closed transaction sides. In the category of Top 5 Year Movers, Howard Hanna ranks second in the nation in their increase in closed transactions over the past five years, 2014-2018, with an increase of 35,290. Howard Hanna’s ancillary businesses of mortgage, title and insurance services are also ranked in the 2019 REAL Trends 500 report. Howard Hanna Mortgage Services, ranked by closed mortgage units, is the 3rd largest real estate mortgage company in the United States. Ranked by number of homeowners insurance policies sold, Howard Hanna Insurance Services is #2 in the United States. Ranked by number of closed title units, Barristers is #5 in the United States, moving up two places from last year. Ranked by number of home warranty polices sold, Howard Hanna Insurance Services is #3 in the United States. About REAL Trends: REAL Trends has been the trusted source of news, analysis, and information on the residential brokerage industry since 1987. REAL Trends is a privately-held publishing, consulting and communications company based in Castle Rock, CO.
About Howard Hanna: Howard Hanna Real Estate Services is the 3rd largest real estate company in the United States, the #1 privately owned broker in the nation, and the largest home seller in Pennsylvania, Ohio, and New York. The family-owned and operated real estate company specializes in residential and commercial brokerage service, mortgages, closing and title insurance, land development, appraisal services, property and casualty, corporate relocation, and property management. With 312 offices across PA, OH, NY, VA, MI, WV, MD, and the Carolinas, more than 11,000 sales associates and staff are guided by a spirit of integrity in all aspects of the real estate process. For more information, visit www.howardhanna.com, or www.facebook.com/howardhanna.